Tree Removal – We have experienced and caring crews that will safely remove your unwanted or dangerous trees. 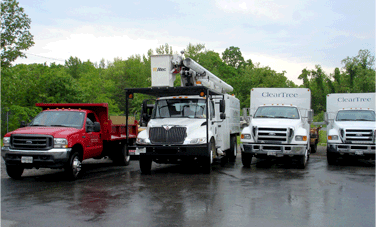 We have a 75 foot working height bucket truck that makes it safe and efficient to take down and remove many trees. We also have experienced climbers that can safely dismantle your trees as required. When necessary, we offer a crane service to remove your trees. Tree Pruning – We are tree pruning specialists. We perform careful and proper pruning of your trees to promote healthy long-term growth as well as removing dangerous portions of your trees. Please note that we do not use climbing spikes when pruning trees which is illegal in Maryland and very harmful to your trees. Stump Grinding – We offer the best stump grinding service in the tree industry. We grind below grade and remove the excess stump grindings. The ground is left level and ready for grass seed or sod once we are finished. (Most tree companies do not remove the excess stump grindings). We offer competitive pricing for our services. However, we cannot compete with unlicensed or uninsured companies. Workman’s compensation insurance and general liability insurance is very expensive in our industry. Many tree companies cut corners in order to make sense of low pricing. We do not cut corners and we are not willing to risk our customer’s property or the safety of our employees for the Cleartree owner’s benefit. Your satisfaction is very important to us. There is a difference in tree companies and it will be evident once you have worked with us.